MEET offers a range of products engineered to very specific application needs and which are very unique of their kind. In their respective field of use, these products are highly appreciated for their performance and lasting reliability under the toughest operating conditions. Contact us for sales and pricing information. You don't find the product you're looking for? Ask us: we are glad to design it for you. A USB HID (Human Interface) device with configurable inputs and an RS-232 serial extension port. 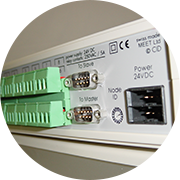 A universal I/O extender with 8/16 analog inputs and 8 analog power outputs. 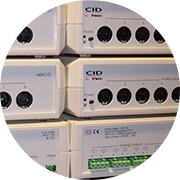 A universal I/O extender with 16 isolated digital inputs and 16 relay outputs (250V/8A).